Abstract: No need to worry about the traffic jam and crowded bus or metro since you have Airwheel self-balancing scooter. After a busy week, don’t spend your weekend at home. Hanging out is the best relax for you. No need to worry about the traffic jam and crowded bus or metro since you have Airwheel self-balancing scooter. 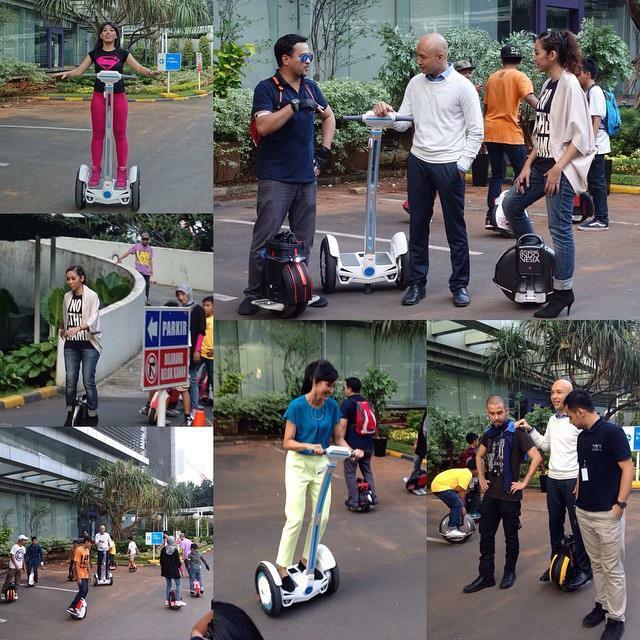 It is a great way to relax your body and relieve aches by riding electric self-balancing scooter. Now invite your friends and family to go for a vacation of sunshine, delicacies and joy! It is weekend that support most people through busy working, thus how to relieve fatigue and spend a meaningful weekend becomes an inevitable topic. Let’s go out by intelligent self-balancing scooter and stop shutting yourself in and get rid of traffic jam. We only need sunshine, delicacies and joy! Don’t feel well-relaxed by lying in, watching TV series or playing games on weekends, in fact you’ll get tired on Monday and will be lack in passion on work. Don’t blame it on the Monday Syndrome; it is your wrong way of relaxing to blame. Our fatigue mostly comes from the boring staid life, but if you go out to learn more new things and know more friends, you’ll regain your passion and adjust your mood, which enables you to get a true rest. Don’t be afraid of the traffic jam or getting tired when go outside, since you have Airwheel self-balancing scooter which makes your travel freer, easier and more pleased. Sunshine and delicacies are the best treatment for depression, they help you to relieve pressure and comfort feelings. Of course don’t forget to bring your family and friends, the more we share, the happier we’ll be. On weekend, just hang out with your lonely friends, no matter to the street or countryside, Airwheel intelligent electric scooter will be your company and share happiness with you. Proper riding can strengthen the ability of the heart and lungs, and increase your body litheness. Of course you can also take your parents to spend the rare weekend time, accompanying them as they used to accompany you, and you’ll surely recapture the happiness and joy of your childhood in the beautiful sunshine! Learn to relax and enjoy your life! On weekend, treat yourself to a true relaxing vacation by riding Airwheel self-balancing scooter. Please be used to this way of relaxing, and feel the wonderfulness and joy!